Though you can send calls directly to voicemail and mute incoming calls, you can’t really block a specific caller on the iPhone. Rather than keeping your phone on silent all the time, you can selectively mute only specific callers by using a special silent ringtone and assigning it to a Contact you want to ignore. Here’s how to make a silent ringtone (or download a pre-made one) and then set it to a contact. If you don’t have QuickTime Player you can always download a premade m4r here or find a premade silent mp3 and convert it to m4a with iTunes. Now anytime the caller set to the silent ringtone calls, only they will be muted. Everyone else still rings as usual. This is such a useful feature that I’m hoping Apple includes a “None” option for ringtones in a new version of iOS sometime down the road, but until then this blank ringtone approach works just fine. I do a nifty little thing for callers I don’t care to receive calls from and this will be a nice add-on to your silent ringer. I created one contact called “BLOCK” and I add all the numbers that I want to screen to that name. Now I will assign the silent ringer to the BLOCK name. Thanks for the tip! When is google going to make an app that spam filters the numbers you don’t want calls from?! With Google Voice’s settings, individual telephone numbers can be blocked, or sent to a different voicemail than other callers, or sent to your phone. I do as @max does. Soon as you find out its a number you dont want future calls from, just hit “add to existing contact” and slect your blocked callers contact. The silent ringtone cleverness is a good suggestion. On topic of ringtones, you can create custom vibrations to assign to contacts. At work, we developers are 3-5 people on these slightly-divided but single long desks and phones tend to sit on desk in owner’s visual sightline, so when one vibrates, everyone is looking at their phone. To make your own good vibrations, start by going to settings->accessibility and turn on custom vibrations. Then goto settings->sounds and scroll to bottom to find vibration patterns. My approach is similar, but a bit more effective. 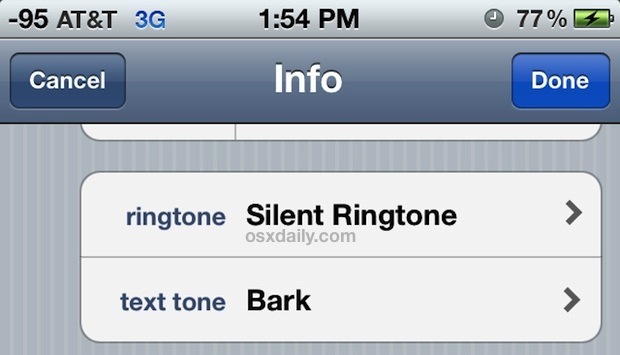 I set the silent ring as my default, and then assign other ring tones to specific contacts. So by default, all incoming calls are silent, but family and friends ring their assigned audible ringtones. The inability to do this for unknown/blocked callers is the only reason I consistently jailbreak. Thank heaven for iBlacklist. Thanks for this information (and comments). I’m getting about half a dozen nuisance calls a day right now and this has been extremely helpful. Thanks for this. I currently have a hospital fax machine that won’t stop calling my cell phone. This seems to be the only solution! Man this is awesome. Thanks for posting. I just added 32 numbers from my “missed calls” list to one “blocked” contact. Way better than paying AT&T $5 a month to do it – and who knows if the FCC will ever stop this cluster.